The first field trials of the B-57 in the LABS maneuver are described by the first B-57 pilot to try them. In November, 1955, I was a B-57 pilot in the 71st Squadron of the 38th Bomb Wing stationed in Laon, France. I was notified to report to Col. B. B. Taylor in Wing Ops. with my Navigator, 2/Lt. Louis F. ("Rock") Miserocchi. When I arrived, Col. Taylor handed me a thin, blue cardboard bound, folder. He said it was the Eglin AFB report on Low Altitude Bombing System (LABS) for the B-57. We were to study the folder and leave it with him, because it was classified. We had been selected by him to go to Wheelus, AB at Tripoli, Libya along with Maj. Craig L. Jackson, one other officer, and two enlisted maintenance people. Rock and I were to do all the flying. The purpose of the trip was to find a system with which to get the Wing combat ready in nuclear weapons delivery. The Eglin report was admittedly very limited in scope and testing. We were to try it and see if it could be used. At the point of release, the aircraft was at the vertical. As the attitude indicator tumbled, the pilot released the weapon. This is the only known photo of the maneuver (Courtesy Robert Mikesh). See the text for description. 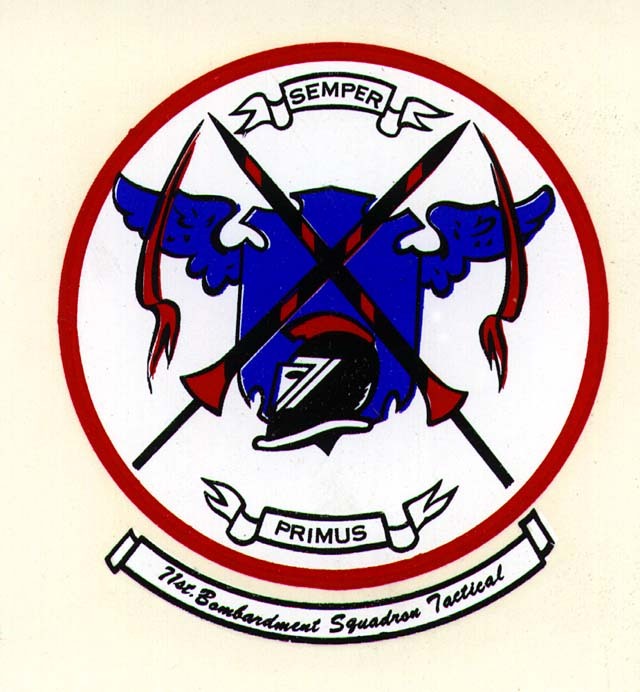 The Eglin report required level flight at 1000 feet AGL [above ground level] at 425 knots and using the gun sight depressed at a given angle. When passing the target with the gun sight, a 3.5 G [gravity reading] pull-up was initiated and bomb released at the start of gyro tumble (attitude gyro precession), approximately vertical. We found immediately that the gun sight ran all over the desert in the turbulence because of the low angle setting. Maj. Jackson suggested trying pretty much the same approach but as close to the ground as possible and pulling up at a time determined from an initial point using a stop watch. This was a "manual" means of accomplishing the same thing as the LABS computer. We knew wed never get those. Miserocchi got busy and figured a drop time/point past a prominent IP. First bomb was 4000 feet off because Rock had made a simple mistake in mathematics! For all our test drops, including the 4000 ft error, we averaged 825 ft. CEP (circular error of probability)! The information we gathered was used to make the wing combat ready. When we finished our short session of test drops, the wing arrived at Wheelus for briefing on what we had learned and flying started immediately. About one-fourth of the pilots had asked for, and been given, a training flight in aerobatics to be ready for the Immelman type maneuver required in LABS bomb delivery. This was done prior to arrival at Wheelus. No major problems were encountered in getting the wing combat ready. There were a few incidents. One pilot flew with his fuel panel set incorrectly and flamed out both engines while belly to the ground at 425 knots with c.g. (center of gravity) out of limits aft. He pulled up, reset the fuel panel, and got instant re-lights. Two pilots looped out of the bomb drop when they became too interested in where the bomb would hit, and escaped with only a fright. Several base flight aircraft overflew the range to watch the "bombers" do Immelmans. 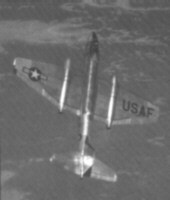 One F-86H made several attempts to fly wing on a B-57 throughout the maneuver. He was only able to stay in until about vertical and the difference in turn rates took over. It's difficult to give enough credit to the others for what they accomplished in such a short time. Lt. Miserrochi, though the least experienced, made my job a breeze. He questioned everything, came up with data that we could only guess at, analyzed and presented finished products that the rest of us couldn't argue with. (He also made his own range charts for the B-57 that were better than those in the book). In flight, if I spoke, he wrote it down. He had the foresight to check out a GI stop watch before we left the States and bring it with him to Wheelus. The wing became combat ready with two stop watches! There just werent any around the theater and had to be hurriedly ordered. The two maintenance people provided perfect maintenance support. (Once they removed the attitude indicator and rushed it to the shop to get some much needed attitude angle measurements done, then reinstalled it without causing any delay in our flights. We tried low angle toss, too, and it worked quite well, although not quite as accurate. Wing said lets stick to the Immelmann and keep it simple, so that was the way it was. With this kind of help, I fondly recall one of the best flying times of my life. © Copyright Marquis G. Witt, 1998,1999, 2000, 2001,2002,2003,2004,2011: Materials may be freely copied and distributed subject to the inclusion of the copyright notice and the web site address. The site is intended for historical and informational purposes. This site contains links to other Internet sites. These links are not endorsements of any products or services in such sites, and no information in such sites has been endorsed or approved by this site.